There are no limits to the number of Users in your Hull Organization, or the volume of data associated with each User. Users have a unique identifier in Hull to recognise individual people. Hull supports three types of User identifiers. Identifiers from external tools, services, and databases are then associated with the unique Hull identifier according to the set of claims ingested. Learn more about identity resolution on Hull. All data about individuals is stored in [User profiles](/docs/guides/tools/profiles/ which are accessible via the Users tab in the Hull dashboard. Data is stored as Attributes (Traits, Properties) and Events (Actions). There are no limits to the number of Attributes or Events per User. User Attributes are displayed on the left hand column, and a timeline of User Events are displayed on the right-hand column. When a User Attribute or associated Account Attribute is updated, or a new User event captured, then this change will be propagated to all listening Connectors. You can configure this in the Settings tab in each Connector. User Attributes can also be exported via the Export API and synced in batches to connectors using the Replay feature. User Events represent actions taken by, or taken on a person. User Events are displayed in a timeline on the User Profile. Users can have any number of Events. Hull auto-generates events like User Created User Merged Segments changed. Changes to User Attributes are tracked as Attributes Changed events. Event retention depends on your Organization’s billing plan. Events will be deleted after your period. Hull represents companies as Accounts. Users can belong to one or zero Accounts only. Your Hull Processor code writes User-Account associations. User Segments can be built using User Attributes, Account Attributes, and User Events using the segmentation tool. 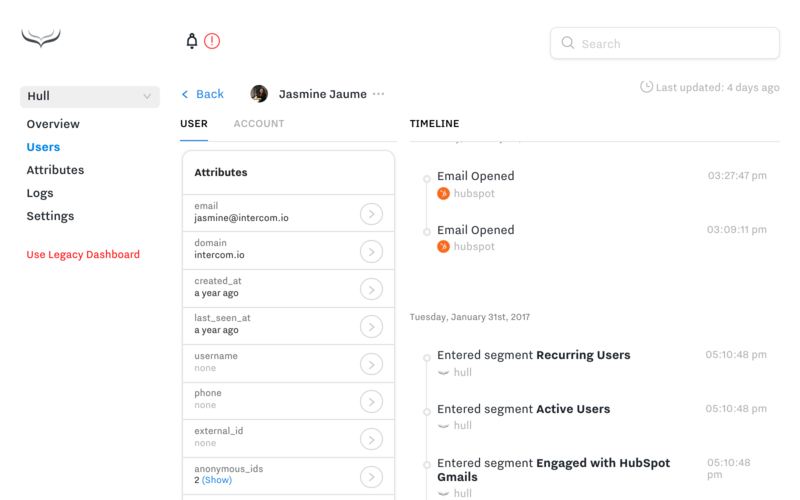 User Segments are updated whenever any member of the User Segment is updated or if a new User Event is tracked. If a User Segment has a relative time component (e.g. Last seen less than 7 days ago), these segments are updated every six hours. Learn more about how Hull updates segments. Users can belong to any number of User Segments. The number of Segments is limited by your billing plan.